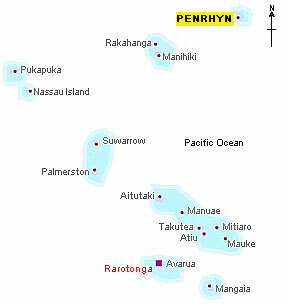 Penrhyn is the most far flung of the Cook Islands. And it lies just 9 degrees below the equator. At 11.2 kms (7 miles) wide and 24.1 kms (15 miles) long, it's also the largest atoll in the Group and one of the largest in the Pacific. Penrhyn comprises a ring of coral 77 km (48 miles) around, and just 4 metres (13 ft) above sea level at the highest point. Its superb lagoon covers 233 sq. kms (90 square miles) of which 62 sq. kms (24 sq. miles) are covered with pearlshell. That, and mother of pearl jewellery are among the main sources of income. The aerial view gives you a feel of the vastness of the lagoon, which is surrounded by 53 motus or islets. But you need to get closer to appreciate its real beauty, captured above left in a stunning photo by Marcus Gleinig of Air Rarotonga. This is the only island in the Cooks without any ariki or paramount chiefs. The entire hierarchy disappeared in the early 1860s when Peruvian labour traders arrived on the island and shipped hundreds of men, women and children to the mines of Peru with the blessing of the island's missionaries. Over 80% of the population was never seen again. 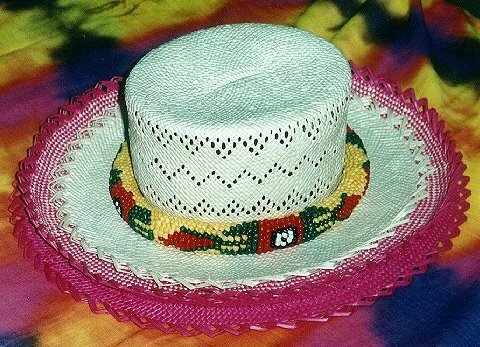 Some of the finest rito hats are woven on the island and bring high prices on Rarotonga. According to one author who spent some time on the island, ping pong here is a type of group date, where a man and a woman each invites a "team" of four friends to the beach. They then pair off in couples if they feel so inclined. The "Christmas Games" are allegedly for "cleaning, cooking and dancing", and usually involve unattached residents. First the women move one village west for a week. After the new year, the men move one village east for a week. When the "chores" are done, all return home. Source: Cook Islands Companion Elliot Smith. Pacific Publishing Company, Albany, California. The birth rate on Penrhyn is the highest in the Cook Islands. Visitors to the island can stay with Soa's family in their three bedroom home in the main village of Omoka. The host, Soatini takes guests fishing and organises tours of his pearl farm. The lagoon is teeming with sharks - mostly the black tip species which islanders say won't harm humans. They should know as they dive among them to harvest precious black pearls which are farmed in the warm, clear waters. The island has an airfield, thanks to American GIs. About a thousand of them arrived on the island on 8th November 1942 and stayed untl 20th September, 1946. They built a 10,000 foot (3 kms) long runway as part of an alternative supply route from Hawaii through to Australia and New Zealand in case hostilities in the Pacific reached this far east. It's since been shortened to 1700 metres. Early Polynesian settlers called it Tongareva - a name still used to this day - meaning "south of the empty space". And there's a lot empty space around it. The nearest neighbours are Rakahanga, and Manihiki 322 kilometres (200 miles) to the southwest. The modern name comes from the ship, Lady Penrhyn which passed by the island on 8 August, 1788. The first contact between the islanders and explorers didn't happen until 1816 though, when crew of the Russian vessel, 'Rurick' commanded by Otto Von Kotzebue traded with the locals. Ashley C. Curry from Alabama, USA wrote to tell me that his father was the pilot of the plane And he generously shared some family photos which have never been seen publicly before. Below are his father, Lt. (later Lt. Colonel) Benjamin P Curry, left, with a Mr Campbell who was airport manager on Rarotonga and right standing in front of the ill-fated bomber. The plane itself in all its former glory is pictured left on Rarotonga. Ashley wrote: "My father, now deceased, told me that he was on a bombing mission and that the plane received extensive damage from anti-aircraft fire, and that he landed the plane with the crew on board. He sustained minor injury to his ankle, but all survived. He continued his service and piloted another B24 named the 'Shady Lady'. He served throughout the war and returned home when the war was over." It's neither easy, nor cheap! Air Rarotonga has only a guideline schedule and you need to visit their website to find out when and if they are flying. Even then, flights can be cancelled at very short notice if there aren't enough passenges to make the trip viable, or if there's insufficient fuel at Penrhyn to enable the return trip. It takes four to six hours to reach the island. And you'll pay around NZ$1,6000 for a standard return. Alternatively, you could try getting there by sea, either from Rarotonga or one of the other northern group islands (assuming you can reach them as well). There are inter island vessels, if you don't mind very small boats! If you want to explore that possibility, speak to the harbour master at Rarotonga for information on sailings, which are few and far between.